Sonam Kapoor launches her own app: Pretty Cool!!! Yes you heard it right, 'Neerja' actress Sonam Kapoor has launched her own app which will offer her fans direct access to her life. This news came to light when, she took to Twitter and announces: ''Sharing #SonamSurprise with you! It's my all new exclusive app! http://bit.ly/SonamSurpriseIsOut .." So join my tribe and always be the first to know!!''. You can catch her through this too - #SonamSurprise is here! To know more SMS Sonam to 5757505 And be the first to find out! The app will have all features attached to it from live streaming, exclusive content, fan chats, competitions, app merchandise, messaging to social media aggregation, etc and many more that we can’t think of. Yes the beautiful and stylish Sonam Kapoor has made it very easy this time for her fans. She has always adored and loved her fans and with this app, I'm sure all are gonna be more close to her. It will be easy for her to keep in touch and share good as well as bad experiences even when she is away filming or in the city. Fans be ready to create a deeper and special bond with her every time you want. Aamir Khan is on a new high! Buzz is that the actor has purchased his very first bike! 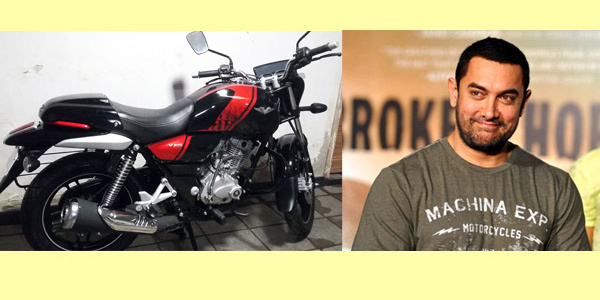 We were told that Aamir recently bought a two wheeler that is extremely special! The vehicle has been manufactured from the scrap of the most iconic ship INS Vikrant! Aamir, who is currently busy with 'Dangal', has been an ardent fan of the Vikrant. He is someone who knows the history and wanted a part of the history. And Aamir has booked and waiting for his delivery, which has come today. This makes the bike even more special for the actor who always wanted to buy a bike that was made out of the remains of the most iconic ship of India! The actor holds a piece of history with himself now and couldn't be more happier! The actor has parked the vehicle at a special place below his building and holds a very special place for this one.